My name is Monica Peacock. I have always loved sewing & crafts for as long as I could remember. I wanted to be an interior designer or owning my own crafting store, but life had other plans for me. I married my sweet heart at a young age. It has been over 20 years & we are still very much in love as the day we met. We started a family early in our marriage & we grew up with our children. When my daughter was young, I made most of her cloths because she was so tiny & it was hard to find cloths to fit her properly. Then my life changed August 2007, I suffered a massive stroke. the doctors gave me 15% chance of living & if I did live I would be vegetative state. Through modern medicine, fast acting doctors, nurses & prayers of my friends, family & strangers, God performed a miracle for me & I left the hospital a week after my stroke. After months of rehab, surgeries and re-learning how do basic things, I was on the road to recovery. My sewing machine was stored away. I got rid of all my fabric believing I would never be able to sew again. Fast forward to 2012, I struggled what to give my daddy for his birthday. A dear friend of my family made a quilt for my husband. I seen how much he loved it and still does (we "fight" over it at bed time...lol). That is when I decided to dust off my sewing machine & make my daddy a Coca~Cola quilt. I have learned through trial and error what material to use & not use. I was officially hooked on quilting. It has been the best therapy for me. Below is a picture of my daddy's quilt. I made this Batman Quilt for my niece who is an avid Batman fan. This was my own design and pattern. The houses, windows and logo were all appliqued. I was in the Starbucks mug swap. The idea came from a reusable cup that looked similar to this mug. 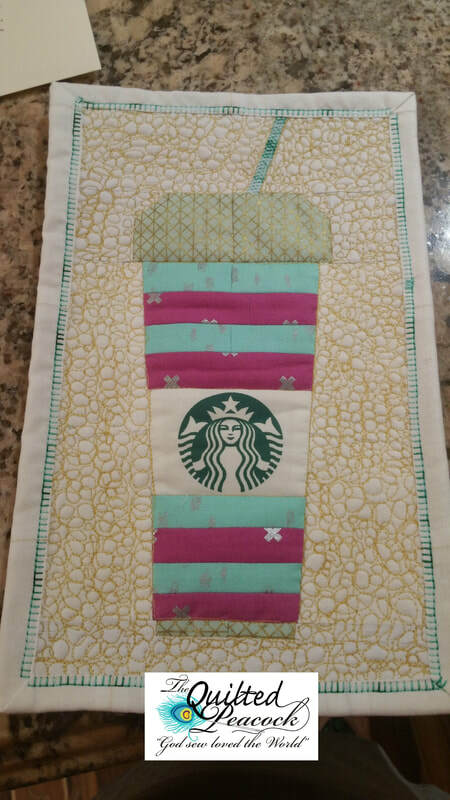 I drew up a rough sketch and literally "winged" it on this mug rug. It was quite an experience to say the least. I was so surprised with the finished product. I joined a Beetles mini swap. I embroidered the faces and title. I used a vinyl record that I had, to made a template of a record. I free motioned quilted some of the beetles hit songs. The recipient of this mini was Carol Lyles Shaw! How cool is that! 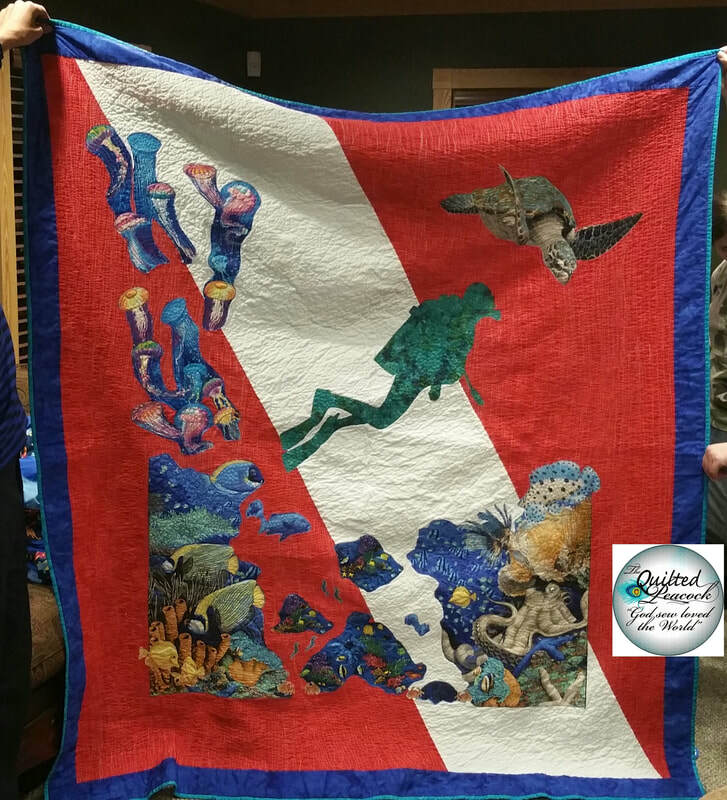 This quilt was made with the Puddle Jump pattern. I thought making all the blocks would never end. forget about all the pieces I had to cut. Yikes! I am impatient like that, sometimes! Anyways it was for my big brother who never needs anything and is very hard to buy for. Mijo, you know who you are! I love him very much. Where is the heart emoji when you need one.